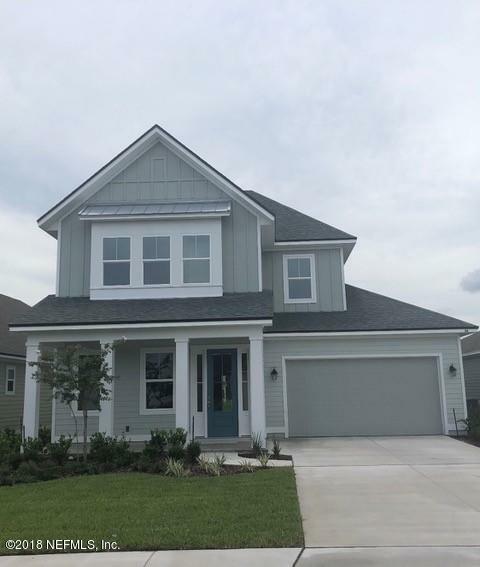 READY NOW Riverside Homes stunning Franklin plan, same as model, features a guest suite and master suite on first floor with 2 additional bedrooms and a loft upstairs. The structural and design features include 10' ceilings on the first floor and multiple ceiling treatments add to the open and spacious feel. Enjoy cooking in the chef's dream kitchen with Bosch appliances including 5 burner gas cooktop double ovens and under counter microwave drawer. Wood style tile flooring throughout the main living spaces with beautiful gray shaker style cabinets and quartz countertops in the kitchen! This home will be move in ready is Ready NOW just in time to enjoy the Nocatee splash park for the summer! Crosswater pool and park coming soon.